This Election Day Rochester, N.Y. finds itself once again in the spotlight as the home of Susan B. Anthony, a leading suffragist who spent her whole life working toward voting rights for women. Today thousands of visitors have passed though historic Mount Hope Cemetery in Rochester to pay their respects to Susan B. Anthony, whose family is buried in the 196 ft. Victorian cemetery. The act of visiting Anthony&apos;s gravestone and leaving an "I Voted" sticker has become a ritual every year on election day. 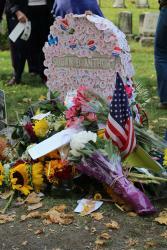 But in 2016, the act of paying tribute to Susan B. Anthony at her grave stone has reached a new level. Rochester and Susan B. Anthony&apos;s final resting place at Mount Hope Cemetery have attracted media coverage and attention from around the world. Here&apos;s where you can find Rochester and Susan B. Anthony in the news. Can&apos;t make it to Rochester to see the outpouring of support for yourself? Local CBS affiliate WROC-TV has been sharing a live stream of the grave site and the line of people patiently waiting to pay their respects to Susan B. View the live stream on Facebook here.